Important notice: Please have in mind that term bong has been restricted in the USA especialy in some states, you should check your local law prior anything else. 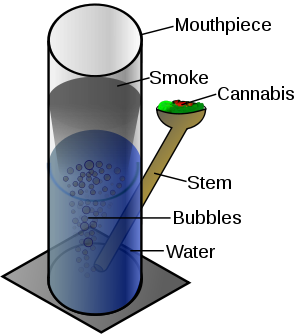 If you visit a headshop you should refer to a water pipe or just a tube. We at headshops.us use the term bong only for educational purpose, you might visit "Bong" (wikipedia) to find good articles related to bongs as well. Historians and archaeologists relentlessly search for proofs and evidences embodied in prehistoric and ancient artefact's found in various places and coming from various times. All these clues help to form the story of hemp and cannabis use in various cultures, up until today. Many serious researches have been done in this area and a number of respected researchers have devoted their whole careers to this particular field. Many prehistoric findings confirm the use of cannabis in earliest times. But where is pot smoking coming from? How exactly did they smoke cannabis and what kind of pipes did they use?What was the bong made from: glass? Wood? Right now there are a number of disagreement when it comes to answering these simple questions. It's an established fact that inhaling incenses was practiced since ancient times in many parts of Asia. But many findings are pointing that smoking cannabis probably first started after the discovery of America. When the first European settlers met Native Americans, they have quickly learned about smoking tobacco from them. Smoking tobacco and some other herbs, was an essential part in various religious ceremonies of Native American cultures. Later, the smoking of tobacco spread through the trading routes to the rest of the world and at some point, someone somewhere discovered how to use cannabis with pipes. On the other hand, some other sources claim that smoking marijuana with pipes came originally from the Middle East, specifically from the Arab culture, where pipe smoking was widespread and popular, especially with the use of Narghile's. Perhaps both stories are correct, and the criss-crossing of influences from America and Asia created what we know today as bongs and pipes. But the story doesn't end here. Recent archaeological discoveries have revealed that some sort of pipes for using cannabis were used in believe it or not Africa, long time ago. The primitive African pipes were made of naturally available materials like animal horns, primitive pottery, gourds or other available materials. It is well known that Arab merchants operated on trade routes spanning all the way from central Africa to India and back to the other side of the world, to Europe. The first pipes were quite primitive and actually such kind of primitive pipes were used for a quit long time. When did the first glass pipes appear? Once more, no one knows for sure, but glass making techniques have been known in Egypt and Iraq for thousands of years. The thing is that this technology was extremely expensive and only kings and rulers had access to it. Artfully made glass pieces were sometimes expensive as jewels were! Real and widespread use of glass pipes started only in modern times. In modern times before glass pipes, all that was available were ceramic and plastic pipes. First glass pipes became available during the golden years of the Hippy era, the early '70s and '80s. Some pipe historians mention the name of a famous contemporary glass artist Bob Snodgras as most influential on the development of modern glass pipes. Mr. Snodgras was the artist who discovered the fuming method of glass pipe making. Fuming is a process by which small amounts of gold or silver are added to the glass pipe, which creates beautiful effects when the pipe is being used. Nowadays modern technologies are used and many other technological improvements have been made, such as use of various oxides, flame-works and so on. Due to their beautiful designs and effortless use, glass pipes are the most used devices for smoking cannabis. And as this trends continues to grow more and more people choose to use glass pipes for their pot smoking habits.